Want to hear about the best examples of enterprise computing today? At Open Stack Silicon Valley, August 9-10 you will hear about some of the most innovative implementations in the market and what you will find is that the majority are not purely in the public cloud, nor are they solely in the data center. Enterprises today are getting the most benefit when they take advantage of both, and use the hybrid model of cloud computing. Why? Because using this “blended” model lets you stop worrying about where your apps are, and focus more on how to leverage the right resources for the right value that helps you deliver innovation and create new value streams for your business. According to IDC, eighty-two percent of you already have a hybrid cloud strategy -- but are you utilizing the mix of resources for maximum gains? Despite what other cloud market leaders might tell you, hybrid is not a temporary state but the new normal and the normal for decades to come. That’s because compute and data are everywhere and being generated everywhere. And if you want to deliver greater business value you need to embrace and leverage this breadth. In my session at Open Stack Silicon Valley, on August 10 at 10:00 am PDT, I’ll take you through why leading organizations are thinking hybrid now and for the future. The catalyst for this thinking isn’t infrastructure ownership, control or security. It’s what’s right for the apps. Want global reach, massive elastic scale, and a wealth of innovative compute and data services? Use the public cloud: that’s what it was designed for! Perhaps you have a factory automation solution, point-of-sale system, or a legacy application that you’d just as soon keep in your data center for now. If there’s a good reason not to move to the cloud, you shouldn’t – but think about connecting those apps to cloud-based, agile and highly scalable business workflows, mobile customer experiences, IoT initiatives and other innovations that help drive your business values forward. For example, Microsoft and GE recently announced a partnership where GE’s vast base of industrial computing capabilities will connect to its Predix analytics service running in Azure. “Connecting industrial machines to the internet through the cloud is a huge step toward simplifying business processes and reimagining how work gets done,” said Jeff Immelt, CEO of GE. You can’t move the industrial machines to the cloud, obviously, but offloading all the analytics from the data center to the cloud makes great technical and economic sense. Want to connect on-premises and cloud apps securely so that you have one consistently managed “virtual” data center? 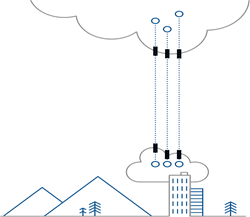 With Azure virtual networking, or Express Route, our dedicated-line solution, you can connect securely and get the bandwidth you need. With Microsoft’s Operations Management Suite, you can have a “single pane of glass” for managing workloads across OpenStack, public Azure, AWS and other deployments. Today, using Infrastructure-as-a-Service, you can easily migrate VM’s from your data center to the cloud. With SQL Server, you can keep your database local, shift to a blended deployment using SQL Server 2016, or trivially move it to Azure – as mobile application provider App Dynamic did: “The transition of [the on-premises] database to … Azure SQL Database only took a few hours,” said Pratik Kumar, CEO and founder of App Dynamic. 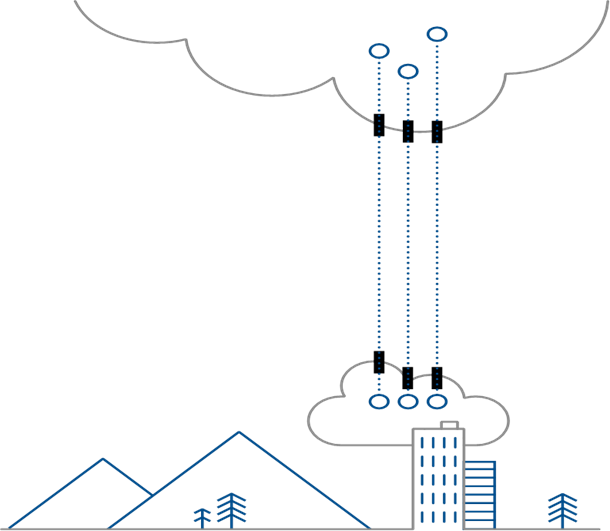 Microsoft offers the most comprehensive suite of offerings for the hybrid cloud, from networking and directory services to application services like SQL Server and big data, backup and recovery, and our Office and Dynamics offerings, all of which can run either on-premises or in the cloud, and can easily connect to other applications running in either location. No other vendor provides such a rich hybrid portfolio, and why? Because we’ve been providing enterprise-grade technologies to our customers for years and we understand your needs. At the end of the day, it’s not about where your computing assets are, it’s how they provide value to your business! Think of the cloud as a new opportunity – not an obligation – for you to drive breakthrough levels of value from your computing assets, and design your hybrid cloud for the maximum business value. Have questions about this premise? Want to hear more about how to implement this strategy at your organization? Join me at Open Stack Silicon Valley on August 10. Already executing on a successful hybrid app strategy? Tell us about it in the comments section below. Let’s get you on stage at next year’s show.